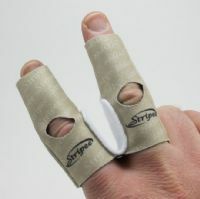 The Stripee line guard protects your fingers while retrieving line, and cleans and preserves your flyline in the process. Anglers fishing backcountry areas where there is suspended sediment in the water frequently end up with abrasions & sore fingers, and the Stripee will prevent this. Also, line burns from stripping a dry flyline across the fingers (or from a fish taking line) of your rod hand are eliminated. Great for bonefishing, tarpon fishing, backcountry and largemouth bass fishing, etc. We have used these extensively over the past three seasons, and now we won't leave the dock without them. Size large fits most folks, X-large for those with big paws. Machine washable stretch neoprene with finger pads.